After installing the Windows 8.1 update this morning, I was surprised to notice that my familiar Windows + S keyboard shortcut to take a screen clipping in Microsoft OneNote was no longer working. What happened? In Windows 8.1, Windows + S is a keyboard shortcut that will bring up a Search bar on the side of your screen. If you want to take a screen clipping instead, you'll need to press Windows + Shift + S instead. Don't like having to press the extra key? Me neither. 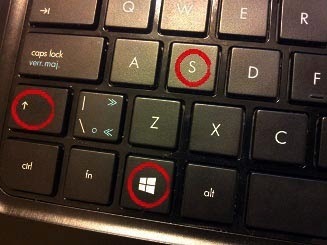 Luckily, the OneNote team posted a blog entry here that explains how to set the keyboard shortcut to Windows + A. This is a slightly more advanced process that involves making a registry edit, but you can go ahead and change the shortcut to something else if you know what you're doing. Otherwise, just stick with Windows + Shift + S.